Today is a big day for me. I am going to be participating in pasty making competition here in the village in a couple of hours and I am so excited. When I told my step-mom Cullene about the contest the other day, she said, ” I never thought I would hear that you had entered a cooking competition.” I worked so much when I lived in America that I barely had time or energy to think about proper meal planning and saved any cooking beyond the basics for special meals. So until a few years ago, I would have laughed at the idea too. Living in Cornwall has brought out some skills I didn’t know I had and the luxury of time to explore new areas is a gift I don’t take for granted. Although today’s pasty competition is mostly an excuse for a party with some friendly competitiveness thrown in, I have to admit that I am taking it pretty seriously. The winning part doesn’t really matter as I have had such a good time preparing a taste of the American south to go inside my Cornish pasty, but you know … it might be kind of cool to win too. I just finished a trial run to see if I could get the twisty fold-over thing down that you do along the edge. It’s a bit tricky, but I think I managed a respectable job. 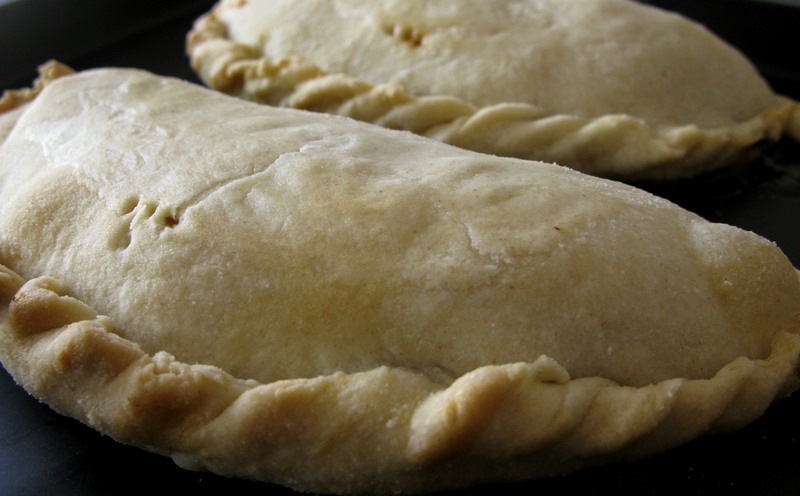 We have to make three identical pasties and we will be judged on taste, presentation, and innovation in the filling. It ought to be a fun evening and I will be taking lots of photographs to share with you later. This entry was posted in Adventure, Cooking, Living in UK and tagged Competition, Cornish, Gifts Of The Journey, Julia Child, Pasty Making. Bookmark the permalink. These look really wonderful. I still have not perfected the pastry foldover. Have fun! So Cool! Have fun and I would love to read about the festivities and the results. I wonder what John thinks of your American style pasty. From your doings around the holidays I would have never guessed you hadn’t been cooking/baking all along. I love that quote from Julia Child. There is a sort of sweet pastry made here in India that looks exactly the same. It is called ‘gujjia’. My mother in law makes them usually for the Holi festival coming up in Spring. She uses a small mould type thingy to get that ‘twist fold’ effect. It is time I joined her. This year I’ll help make them! I’m wondering what the inventive filling will be..maybe that is your differentiator. What’s in the filling? What’s in the filling? Inquiring minds want to know. Such a perfect quote!! Hope the competition goes well!!! I’m going to have a go at making pasties myself. So, how did you do? How fun!! Good luck! Can’t wait to hear how it goes! I have been curious about pasties ever since I read about them in Lillian Jackson-Braun’s books! I started loving cooking again about 5 years ago when I started watching the Food Network. Ironically, I was recovering from gastric bypass surgery! Now I cook everything, just a few bites and take the rest over to my daughters or my friends. Have fun!